This site is dedicated to a railway station that was hidden for 60 years despite being close to the seafront in the city of Tel Aviv. In 1892, a railway line was opened from Jaffa, a port on the Mediterranean Sea since ancient times, to Jerusalem the holy city. This was the first railway in the levant and the trains took about 3 hours to travel the 87 kilometers. This was during the period when the land was part of the Ottoman Empire but after its collapse in 1917 the League of Nations mandated Britain to administer the land which it did until withdrawing in 1947, and in 1948 the State of Israel was created. At that moment Jaffa station was closed, a wall built around the whole site and from that time until the summer of 2007 it was not possible to view the station. In 2004, a project to restore the station was announced and preliminary work started to survey and plan the work. In January 2007 restoration started and six months later the perimeter was taken down and after 60 years the station could again be seen from the coast road that runs between Jaffa and Tel Aviv. 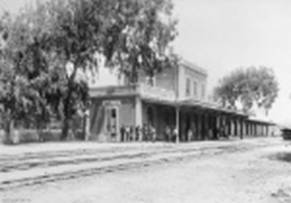 This site contains the first photographs of the station undergoing restoration and were take in August 2007.